Is There Even A Point To This? A friend of mine spotted the following flier hanging in Brooklyn. In short, it states that there are a limited number of openings for the opportunity to do the mitzvah of shiluach hakein -- the sending away of the mother bird. For a "nominal fee*" the person behind the flier will presumably take you to the bird and nest and allow you to perform the mitzvah. 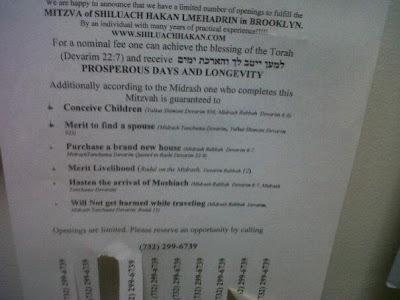 Furthermore, the flier continues, you should not miss out on this opportunity since aside from Torah's promise of "Prosperous Days and Longevity," you are also guaranteed (emphasis mine) a slew of other benefits, including the conceiving of children, finding a spouse, purchasing a house, etc. Personally, I have several problems with this particular flier and with others like it. The first issue I have (with this flier in particular) is the use of the word "guaranteed." How can the rabbi behind this offer (whoever he is) possibly make such a guarantee? Even the promises made by Hashem Himself in the Torah aren't absolute promises -- consider the story that is told about Elisha ben Avuyah (a.k.a. Acher) who saw a young boy die while trying to fulfill this mitzvah and the mitzvah of honoring one's father. That being the case, how can this rabbi make such a guarantee? Will he personally grant a child to a childless couple if they fail to conceive despite his promise? Will he pay the medical bills of someone who *is* hurt while traveling? This is, of course, a part of the general trend nowadays of selling yeshuous (salivations) and promises of miracles. The only difference here is that instead of the money going to a yeshiva, charity or some other organization, this rabbi is using it as a part-time business opportunity. I don't begrudge him the opportunity, but I must say that if I find the selling of Divine promises of salvation distasteful in charitable endeavors, I find it all the more so in a private enterprise. But there's also a deeper, more troubling problem with this offer. Shiluach hakein strikes me as an "opportunity" mitzvah. If you find yourself in a position of wanting eggs, and you find that the eggs you want are in a nest being protected by a mother bird, then have to send the mother away. But what if you don't really want the eggs? Suppose you're traveling on the road (as the case is described in the Torah) and you spot a tree with a bird, nest and eggs, but you have no desire for the eggs. Is there any mitzvah to climb the tree and shoo away the mother bird? Clearly the answer is no -- you don't have to do so and (to my understanding) doing so for no reason may even amount to a measure of tza'ar ba'alei chaim (causing pain/distress to animals). That being said, what is the purpose of this whole exercise? I doubt that anyone who responds to this rabbi's offer has any real desire for pigeon eggs (or whatever other bird it is that he's using)**. Even if he's using chicken eggs, why would anyone go all the way to him when eggs can be had in the local grocery much more easily? So, the whole thing is just an artificial and contrived set up to perform a mitzvah that is just not required. What next? Should I charge people $5 for the opportunity to find my wallet in a side room after I leave it there so that they can perform the mitzvah of returning a lost object? Is that really fulfilling the mitzvah? The entire exercise sounds (to me) so contrived and artificial and completely out of sync with how the mitzvah should actually be performed. * I don't begrudge the rabbi the "nominal fee" (assuming, of course, that it is, indeed, nominal). He certainly spends his time (and possibly money) to arrange this and deserves to be compensated. ** This is leaving aside the question of whether or not the rabbi would even let the person take the eggs away, as this would either prevent him from giving the opportunity to the next person or require him to find a new nest with eggs for each opportunity.